How much does it cost to install an Inground swimming pool? What a great question! Truth-be-told though, asking how much it costs to build a swimming pool is kind of like asking how much it’s going to cost to build a home. There is no real one-size-fits-all answer as costs are dependent on so many different variables from design, to materials, to location. The only real sure-fire way to get a realistic amount that you can budget around is to get quotes from contractors in your local area. That being said, we may be able to help you “ballpark” it (it’s just going to be a big ball-park). KEEP IN MIND: the two main reasons for the large gap in these price ranges are pool size and pool location. What does that mean? Traditionally, the bigger the pool, the bigger the price. The location has to do more with not only local installation price averages for your area but more so the location of your pool in your yard and the amount of excavation that will need to be done to properly level your pool. 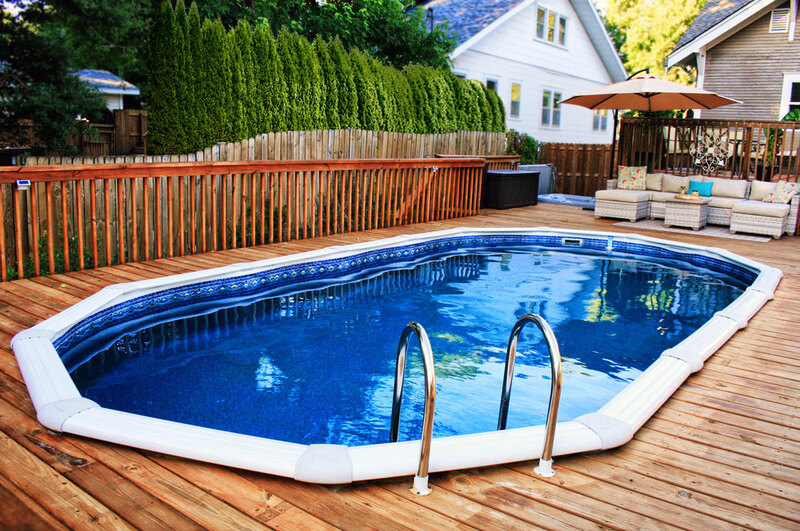 First things first when determining the cost of installation, is knowing what type of pool you’ll be purchasing as each type has its own unique installation methods. While there are many new and out there types of pools these days, for time’s sake we’ll focus on the three most popular pool types here. Just to be clear gunite pools are concrete pools. The term refers to the method used to apply the concrete since the concrete is shot from a gun onto steel-reinforced walls. Once the concrete sets, it is either plastered to a smooth finish, tiled, or painted. Concrete pools have the highest cost generally starting around $40,000 for very small pool often found in Florida, California, and other areas that have small yards. Concrete Pool builders/dealers in other areas generally do not accept builds below $60,000-100,000. Remember how we mentioned that size is a big determining factor when it comes to price? Concrete pools are almost priced per square foot. Meaning if you wanted to double the size of your original design (because you’re fab like that) it would just about double your cost, which is not the case for our other two pool types. Another differentiating quality of the concrete pool is that the cost is for both the pool and the installation since the installation is basically pouring your pool into existence. Fiberglass Pools are normally installed at a price between $35,000 - $90,000, including the pool itself. Size is again a major factor in the cost but Fiberglass Pools can only get so big since they have to be transported in one piece via semi-truck. That means that the biggest cost factor for this pool type is associated with the delivery and locating the pool into the back yard; a process that often requires a crane or two to lift the pool over the house and into its freshly dug hole. 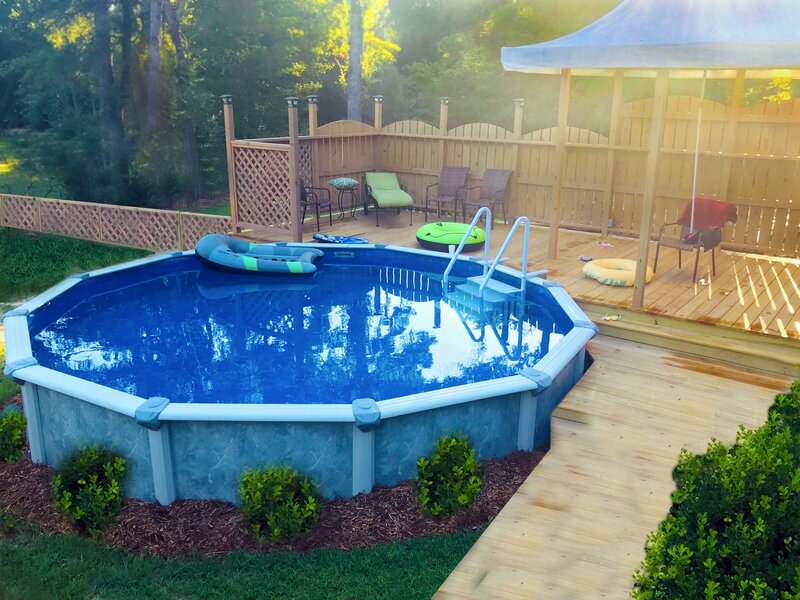 While in some cases it is possible to purchase just the pool in order to attempt the install yourself, due to the complexities of getting this one piece rather large item in your backyard and properly leveled, it is rarely a recommendation. Vinyl Liner Pools have the lowest typical installed price, averaging between $22,000 - $50,000. That being said, vinyl liner pools have come a long way over the last decade in terms of size and customization so much so that it’s not uncommon to see vinyl pools bought & installed for well over $100,000. The reasons are that those pool designs in the past would have had to have been created using concrete (and at a much higher cost) due to previous limitations of the vinyl pool. However, with the advancements in vinyl, step options, coping options, and more, vinyl is officially making a splash in very trendy and high-end pool installations. What the savvy and budget- conscience buyer also discovered is that they could purchase a vinyl liner pool kit separate from the install. If you’re asking why someone would want to do that, well let us shed some light on this amazing revelation. 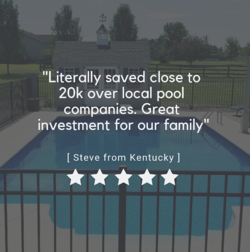 We sell swimming pools at wholesale prices to builder and homeowners alike so that when you buy the pool itself separately, not only do you know how much you’re really paying for the pool but you can also determine how you want to go about installing the bad boy. Have a larger budget, buy the pool and then hire a builder with your leftover budget. Medium size budget, you say? Buy the pool and then sub-contract some of the more challenging work such as excavation, electrical, and concrete filling/decking. Smaller budget but big pool dreams (or just looking for the ultimate bragging rights for your new Pinterest worthy DIY); vinyl liner pools have the most success stories for folks tackling the build themselves. We should know! 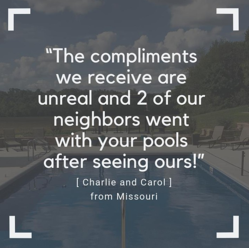 Our customers write in (in the bucket loads), sending us photos of their beautiful magazine quality pools (at fractions of the magazine quality cost) boasting statements like, “I cannot believe we did it all ourselves!” They’re incredibly proud and so are we. This boils down to say that if you can do some of the work yourself, you can shave significant amounts off of the final price of your new private oasis. 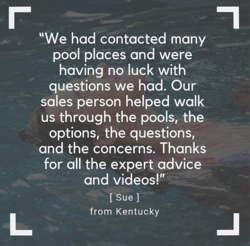 We hope that this helps answer some of your general curiosities on installation costs for an inground pool. Below are some additional resources that dive a little deeper into these and other related topics. Build Your Own Swimming Pool and Save!